The accident took place around 4pm on Monday 27 September. A blue Peugeot 306 was travelling along Earlham Road when it collided with a green bicycle, near the junction with Alexandra Road. The rider of the bike was a local man in his 70s, who sadly died in hospital late on Wednesday. Police have renewed their appeal for witnesses. Norwich parkrun is a timed 5 km run, which takes place every Saturday at 9am in Eaton Park. It was set up in August, is free to enter and is proving popular with local runners and walkers alike, already attracting nearly 200 entrants. Anyone can take part, but you need to register in advance. See the website for further information. The Schoolhouse has opened on Earlham Road, painted a rather controversial shade of sky blue (the council would not allow the original dark blue). The Schoolhouse is offering a great venue for watching big sporting events on Sky Sports. There are old-fashioned video games, a larger garden and premium burgers. It’s sure to be a hit with students and locals alike. The new No 30 service launched on September 27th and runs from Norwich Rail Station, stopping at Castle Meadow, St Stephens, Newmarket Road Interchange, Eaton Cellar House, Bluebell Road and Norvic Drive before arriving at the University. The stop on Newmarket Road, near the junction with Eaton Road, which will in time become the ‘Interchange’: will be a point from which passengers can catch connecting buses to a number of different locations, avoiding the city centre. It is hoped the new service will help with over-crowding problems on the 25/35 services. Norwich's long awaited skate park has finally opened in Eaton Park. Though unofficially open since May the official opening took place with a weekend of stunts, demonstrations and competitions, at the end of July. The £300,000 state-of-the-art facility means skaters no-longer have to travel miles, and it is hoped that the problems caused by skating in the city centre will now be reduced. The opening of the Jenny Lind Park in Vauxhall Street finally happened on August 16th, after a five month delay. Work was started last year and was expected to have been completed in May. Local residents and children from Bignold School were consulted over plans, and their ideas have been incorporated into the £300,000 transformation, which now includes a new play area, multi-use pitches, a social area and improved pathways. A small amount of work is still due to be done: fencing around the edges of the park and planting of shrubs and grass. The new Tesco on Unthank Road finally opened on July 14th. More than 40 protestors gathered outside. It will be interesting to see if the new store does cause the traffic issues that many of the local residents have feared, not to mention the expected detrimental effect on other local businesses. The Grapes Hill Community Garden Group has now been awarded a lottery grant of £50,000. The job has been costed and is expected to be in the region of £89,000, so the group is now hoping to get a further grant of £50,000 from Norwich City Council. The space will be used by local residents to grow organic vegetables. Flowers, trees and shrubs will be planted to improve air quality in the area. Anyone interested in helping out with the garden should contact Fran Ellington on 07729 540482. After years of figting the wishes of local residents, and a long delay after they finally got the planning permission at the beginning of last year, Tesco has said that the new store on Unthank road will open by the summer. The Grapes Hill Community Garden Group has been given a £9,400 grant by Norwich City Council which will allow them to install railings and a gate around the garden. They are looking for a local business to bid for the work. If you are interested, contact them on 07729 540 482. To find out more about the Community Garden project, see the link on our home page. A set of vintage gallopers will be arriving at the Forum in December. Originally built in Norfolk in 1893, the gallopers were made famous by their appearance in Chitty Chitty Bang Bang. They will be open daily from Tuesday 15th December until Tuesday 5th of January (excluding Christmas Day). The £300,000 transformation of the Jenny Lind Park in Vauxhall Street is finally under way. The design is based on ideas put forward by pupils at the local Bignold Primary School, and further consultation with families, young people and other local residents. The plans include two new games areas, a new play area, improvements to paths and more planting. A 60ft Christmas tree is now in place outside the Forum. It is being strung with 10,000 low-energy white lights, and will be switched on as part of the city's light switch-on on November 19th. The tree will be surrounded by a stage which will host plenty of festive entertainment in the coming weeks. The city's Christmas lights will be switched-on on Thursday 19th November. Entertainment begins at 6.15pm, with the switch-on happening at 7pm, with the usual pyrotechnic accompaniment. Norwich Young People's Voices Choir will be performing Christmas songs, Father Christmas will be there, and there will be a special post box for children to post their letters to Santa. The festivities continue around The Norwich Lanes with a Gospel band playing outside Jarrolds from 6pm until 8pm, and mulled wine, mince pies and carols will be on offer at St Gregory's Green from 8.30pm. Work on the controversial new Tesco store on Unthank Road may not start until December. Tesco won the seven year battle with local residents who are opposed to the store, fearing a negative impact on local independent businesses. So far no work has been carried out on the site, and in the mean time Tesco has opened a new store on Westlegate in the city centre and also announced plans to open a further store on Prince of Wales Road. A new 20mph speed limit will come into force later this spring throughout the Vauxhall Street / Newmarket Street area. One of three parts of Norwich where the 20mph zones will be installed, if they are successful the Council plans to extend the limits to all residential roads in Norwich. Norfolk County Council has put forward plans to extend the bus lane along Newmarket Road, from Unthank Road back to the dual carriageway at the Eaton bypass. The bus lane is currently part time, but this would change to 24 hours every day. The proposal also contains an idea to change the speed limit on the stretch of Newmarket Road from Poplar Avenue from 40mph to 30mph, as it currently is at Eaton Road. 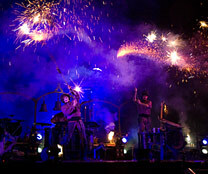 Norfolk and Norwich Festival begins with a bang! The festival kicked off with two free events, the first on Friday 1st; Fanfare Le Snob at the Forum and on Saturday French pyrotechnic team Les Commandos Percu shook Earlham Park with their 35 minute display of music and fireworks. We went along to this spectacular show which questions the relationship between violence and creation, and it was brilliant! A man has been remanded in custody and is due to be sentenced on May 15th, after he admitted carrying out a robbery at the First Edition newsagents in Vauxhall Street in January of this year. Environmental Health officers from City Hall are likely to take enforcement action against landlords at the Earlham House shopping centre on Earlham Road. They have been told to fill potholes in the car parks and to clear away rubbish left by fly tippers. After the 7 year battle with local residents who are opposed to the new store, on the 29th January, Tesco was granted permission to build a new Express store on the corner of Unthank Road and Trinity Street.